Thou shalt love the Lord thy God with all thy heart, with all thy soul and with all thy might. Love and serve that which is good and holy not only with your heart and soul inwardly, but also outwardly with all that you have, all that you own, all the material wealth that you control. TD Bank is certainly NOT doing that. TD Bank is NOT using wealth it controls to love and serve what is good, right and holy. 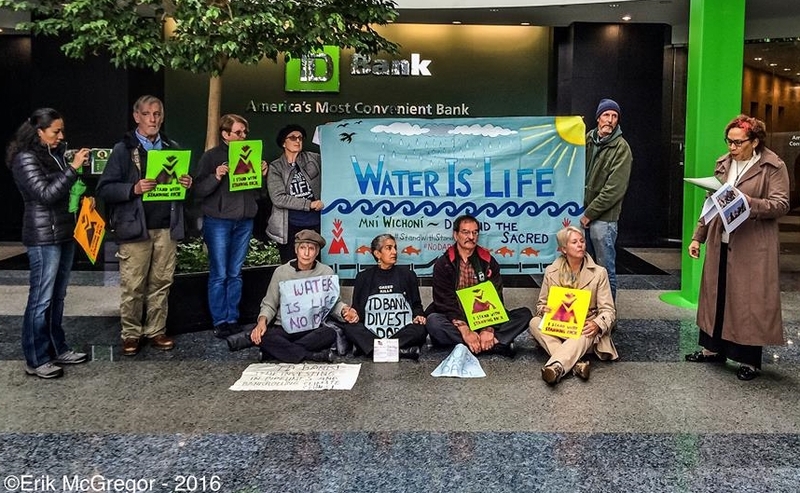 TD Bank is pursuing profits by using the wealth of its depositors to finance a horribly destructive, dirty oil pipeline. That pipeline is fed by fracking our earth, causing earthquakes and irreparable hydrologic damage in aquifers. That pipeline enforces unacceptable risks of spills in places where that is intolerable. That pipeline irreversibly destoys sacred places of ancient people who have never consented to their land being taken from them. The product that pipeline moves is chemically treated, refined, belching out more waste and gasses — so that it can be burnt and fill our atmosphere with only more and more CO2 making climate change ever more severe, so that this very week we are hearing that the Arctic is 20 degrees centigrade above average temperatures for November. TD Bank right now is financing a demonic project that has called in vicious, brutal hyper-militarized police assaults against unarmed, peaceful people courageously protecting their homes, their land, the water that flows through it and their very lives – and all our lives as well. People of conscience the world over demand that TD and other banks stop funding the destruction of our earth and our communities. We demand that TD and other banks take into account the wisdom of ancient religions and just plain common sense that demands that we “serve God with all our might”.